Finding a financial advisor can take time, effort and patience. Whether you’ve never used an advisor before or seek fresh, new counsel, you will need a comfortable and straight-forward approach. 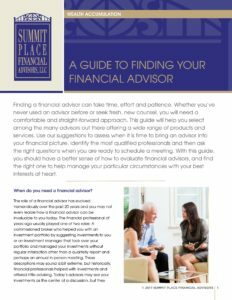 With this guide, you should have a better sense of how to evaluate financial advisors, and find the right one to help manage your particular circumstances. 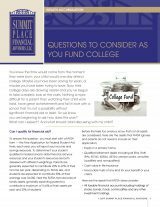 Now that your child’s college days are drawing nearer, you’ve probably taken a closer look at the costs. Nothing is more difficult for a parent than watching their child work hard and fall in love with a school that it is not a possibility without significant financial aid or debt. Thinking through the financial considerations ahead of time can help you and your child enjoy the excitement of possibilities instead of the dread of limitations. After a long winter, we all look forward to the coming of summer when we can prepare for warm weather and barbeques with family and friends. 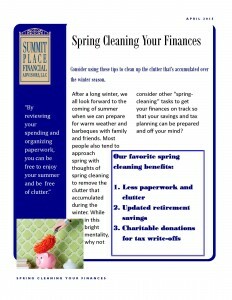 Most people also tend to approach spring with thoughts of spring cleaning to remove the clutter that accumulated during the winter.